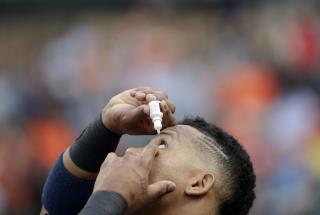 (Newser) – When you put eyedrops in your eye and a bunch of the liquid spills out, that's not necessarily user error. A ProPublica investigation, part of the publication's series on how billions of health care dollars are wasted each year, finds that eyedrops are way too big—some of them more than twice what the eye can actually hold—resulting in drainage and waste. A lot of waste, considering US drug companies made $3.4 billion last year on drops for dry eyes and glaucoma alone. Not only are users paying for the drops that end up wiped on a tissue, but the waste can have a serious impact on patients like Gregory Matthews, who has glaucoma and sometimes runs out of drops before his refill is available—using eyedrops consistently is important for glaucoma patients, because they help keep blindness at bay. Making matters worse? Smaller drops are possible. People I am telling you.. Get 2 -3 of these P o S & well beat them to death for their greed.... Then they can be nice or just get beat. This should not be allowed &it should be a F law & any politician who backs them should be removed & NEVER Allowed to serve the public again. When Abe's vice potus pulled his shite, that day the law should have been changed... Even he went on to serve later in a state... BS crooked politics. Guest honeymoon bed in luxurious hotel. But there are three on the bed, how odd. Big Pharma, Congress, and drug companies are in bed together! How perverted! If these are prescription meds and you can only fill them every X amount of days then how do the companies make extra profits? That makes no sense.